Why do we think that’s so important? You see… just about anyone can run copies and prints. 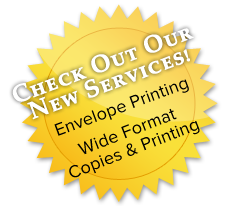 At FlashPrint we take pride in every job, whether it’s one color copy or 10,000 custom binders. We know our customers. We know what they expect. We deliver. Give us a try… you’ll see the difference.